Kanhaiya Kumar, Who has been in the news since his arrest on 12 Feb 2016, as he was accused of giving speech against the nation. Being 125th Member of CPI, he has already filed his nomination from the Begusarai Lok Sabha constituency. and has been getting immense support from Bollywood actress Swara Bhaskar, former JNUSU office-bearer Shehla Rashid, Delhi University student Gurmehar Kaur and other students of JNU. We will report about the whole conversation they had in the meeting. The video shoot showed the simple lifestyle of Kanhaiya Kumar. Rahul Kanwal asked, “aapke ghar me sadagi bohot hai, aise me kya vo sansadhan hai aapke paas jo aapko Vote dilva sakte hai janta se?”. To which Kanhaiya Kumar replied, “I don’t think that, to fight an election, you have to have huge amount of money, Election Commission has set the Maximum budget of 70 Lacs that a candidate can invest to fight an election. Hence We have started a crowdfunding method in which people will give us the money and we will fight an election out of that and this method also shows that, how much people are connected to us and want us to win this election”. Kanhaiya Kumar’s party has collected approx of 35 Lacs for the election from crowdfunding. 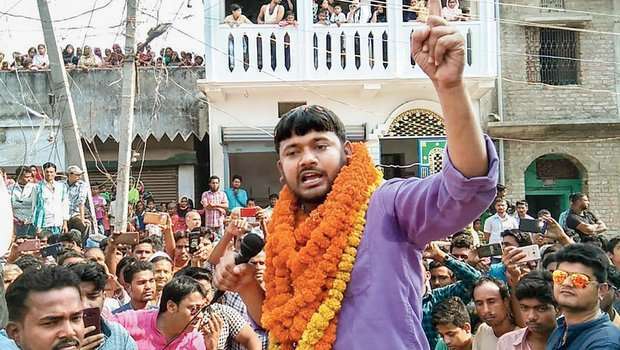 They also visited the Party office of CPI in Begusarai, where people the member of party and the leaders of villages were assembeled to plan for the election and all of them praised Kanhaiya’s work and thought-process for the Begusarai’s future. They also said, “It’s not only about the party, it’s for the child of Begusarai who was accused of the crime which he didn’t do but had to go jail for that reason and had to go through all the pain which a normal human being thinks never comes in their lives.